from today till 16 May 2009 at Atlas Gallery / London. 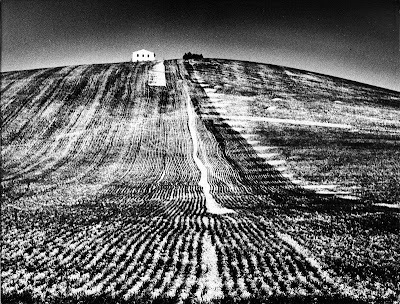 Widely regarded as the greatest Italian photographer of the twentieth century, Mario Giacomelli was born in Senigallia, Italy, in 1925. 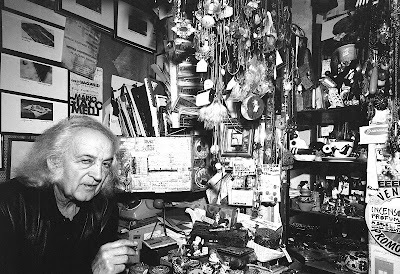 Following a poor formal education, he began his working life as a jobbing printer, before training as a typographer and did not fully embrace photography until he was 30 years old. Despite this late start and his sometimes unconventional almost naïve approach, and in some ways because of it, Giacomelli is now considered one of the most original photographic artists of the twentieth-century. The combination of his experimental working methods with the sometimes brutal imagery of his subject matter create a very personal, but playful and poetic exploration of the region in which he lived his life. Giacomelli’s initial inspiration came from the gritty and grainy post-war Neo-Realist films of Rossellini and De Sica and also from the graphic effects and calligraphic line he had used in printing. He continued to work in, and later run, a print shop in Senigallia throughout his adult life. 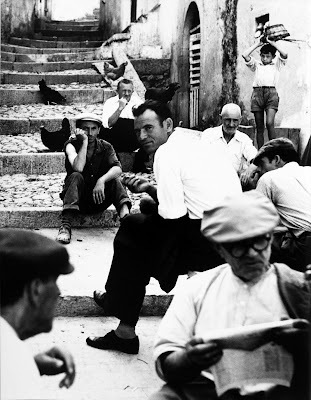 Above all, Giacomelli saw himself as a poet with a camera. His love of written poetry too was to become the principal source of his (self-) education, allowing him the freedom to build meaning into his work and helping him mask the feelings of inadequacy that a poor schooling had left. The exhibition includes original manuscripts of poems alongside the prints, emphasizing the very strong link he felt between these two media. “Photography is not difficult, as long as you have something to say”. Giacomelli’s famous statement underlines his casual disregard for the technical intricacies of the photographic process. Once he was given a new camera with an exposure meter, but threw it away in favour of his simple point-and-shoot model. This rawness of approach is a key characteristic of his work and his obliviousness to accepted dark-room practices resulted in the creation of works which were completely unique in style. 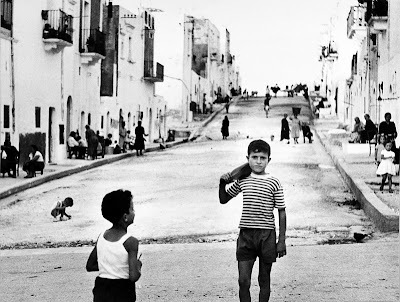 Giacomelli’s work in Puglia in 1957 is one of his most celebrated series. He later wrote: “to look at these images…is to feel the surface texture of plants, to know the labour of the land, the sounds of celebration, the games outside the church, old sun-drenched walls, friendship and human company, quiet relaxation, the events, the ceremonial and religious life, the pride and vitality that are the visible phenomena of society.” The photographs depict an almost idealistic fantasy of how we today imagine the Italian village to look. The prints themselves display Giacomelli’s characteristic use of strong contrast and striking use of form and texture. All the prints in this exhibition come directly from his estate in Sassoferrato, Italy, and were made by the photographer in his dark room, which still remains undisturbed, since his death in 2000, along with all his possessions at his house in Senigallia. Also included are some of his most well-known works from the series Io Non Ho Mani Che Mi Accarezzino il Volto (There are no Hands to Caress My Face), in which young priests are shown joking with each other in the snow, along with a selection of his landscapes. Giacomelli won numerous medals and prizes, and achieved international status through exhibitions in Europe, America and Japan. His works are held in museums, corporate and private collections worldwide. delivered to Fblog by joanna, as a part of the F-week from Italy. stay tuned for more!